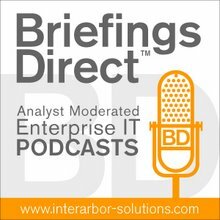 Welcome to a special BriefingsDirect podcast series in conjunction with the recent HP Software Universe 2010 Conference in Barcelona. The ALM suite that HP came out with is definitely giving us a bigger view. We've got QA managers that are in the development groups for multiple products, and as they test their software and go through that whole process, they're able to see holistically across their product lines with this. When HP came up with ALM 11, they took Quality Center and Performance Center and brought them together. That's the very first thing, because it was difficult for us and for the QA managers to see all of the testing activities. With ALM, they're able to see all of it and better gauge where they are in the process. So, they can give their management or their teams a better status of where we are in the testing process and where we are in the delivery process. When we're meeting at various conferences and such, there's a common theme that we hear. One is workflow. That's a big piece. ALM goes a long way to be able to conquer the various workflows. Within an organization, there will be various workflows being done, but you're still able to bring up those measurements, like another point that you are bringing up, and have a fairly decent comparison. We have several groups within our organization that use agile development practices. What we're finding is that the way they're doing work can integrate with ALM 11. The testing groups still want to have an area where they can put their test cases, do their test labs, run through their automation, and see that holistic approach, but they need it within the other agile tools that are out there. McKesson is a Fortune 15 company. It is the largest health-care services company in the U.S. We have quite a few R&D organizations and it spans across our two major divisions, McKesson Distribution and McKesson Technology solutions. That's what we strive for. In my group, we provide the centralized R&D tools. ALM 11 is just one of the various tools that we use, and we always look for tools that will fit multiple development processes. ALM 11 had a good foundation. The test cases, the test set, the automated testing, whether functional or performance, the source of truth for that is in the ALM 11 product suite. And, it's fairly well-known and recognized throughout the company. So, that is a good point. You have to have a source of truth for certain aspects of your development cycle. There are partner tools that go along with ALM 11 that help us meet various regulations. Something that we're always mindful of, as we develop software, is not only watching out for the benefit of our customers and for our shareholders, but also we understand the regulations. New ones are coming out practically every day, it seems. We try to keep that in mind, and the ALM 11 tool is able to adapt to that fairly easily. When I talk to other groups about ALM 11 and what they should be watching out for, I tell them to have an idea of how your world is. Whether you're a real small shop, or a large organization like us, there are characteristics that you have to understand. How I identify those different stacks of things that they need to watch out for; they need to keep in mind their organization’s pieces that they have to adapt to. As long as they understand that, they should be able to adapt the tool to their processes and to their stacks. Something that we've done at McKesson that appears to work out real well [is devote a team to managing the ALM tools themselves]. When I deal with various R&D vice presidents and directors, and testing managers and directors as well, the thing that they always come back to is that they have a job to do. And one of the things they don't want to have to deal with is trying to manage a tool.